The Russian Investigative Committee has reportedly identified the mastermind who organized last month's murder of Russian politician Boris Nemtsov. Russia's Investigative Committee has said that they have identified the name of the person who gave weapons, a vehicle and money to the suspect accused of killing Russian politician Boris Nemtsov, Russia's Kommersant newspaper reported on Monday, citing a source familiar with the investigation. 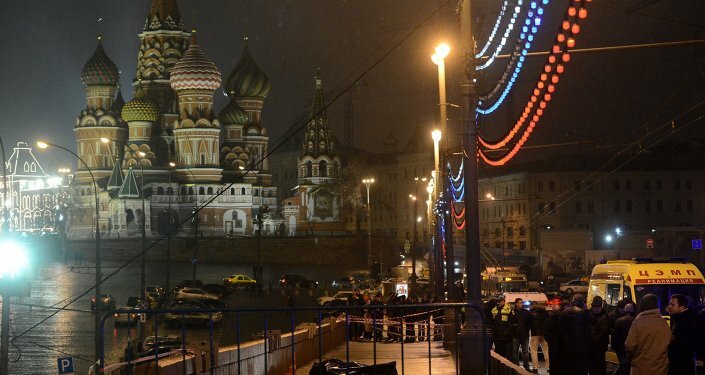 According to the newspaper, the new suspect, known only as Ruslik, delivered a gun and a car to those involved in Nemtsov's murder. He also promised that they would get 5 million rubles (about 85,200 dollars) each. The newspaper claims that Ruslik is thought to have ordered and organized the assassination. The investigative committee is not releasing Ruslik's real name to the general public, according to the Kommersant. Ruslik is not on the wanted list yet, as only suspected killer Zaur Dadayev has mentioned his name to investigators. On February 27, Boris Nemtsov, who served as Russia's deputy prime minister in late 1990s, was shot and killed in central Moscow. Five suspects in the case have already been arrested, including Ramzan Bakhayev, Tamerlan Eskerkhanov, Shagit and Anzor Gubashev and Zaur Dadayev. Dadayev was the only one to plead guilty, but later withdrew his plea after the Presidential Council for Civil Society and Human Rights suggested his confession was made under duress.